Only ½ mile from Leeds Bradford airport, we offer an extremely high standard of car parking security, with floodlighting, 24-hour manned security, CCTV and barbed wire fencing. Our off-site airport car park is in a purpose-built security compound and is only 2 minutes to the airport terminal. We offer free airport transfers to Leeds Bradford airport terminal, so once you have checked in at reception, one of our courtesy buses will transfer you to the terminal check-in. When you return, we'll meet you outside the arrivals hall and return you to the car park just as quickly. 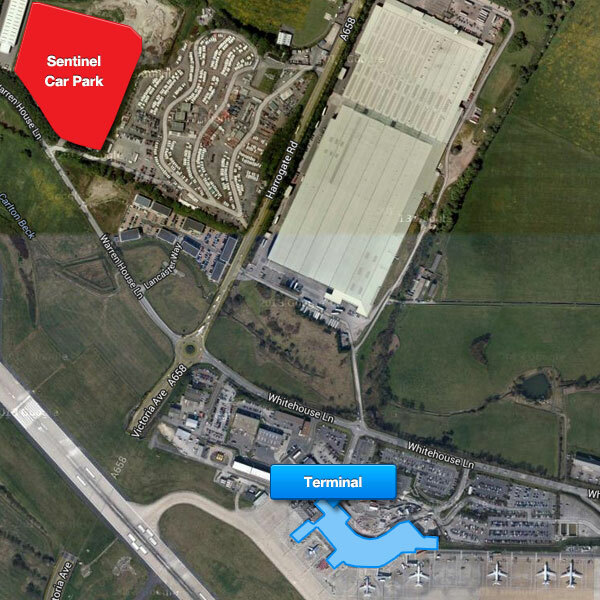 How close is Sentinel Car Park to Leeds Bradford Airport? You can see from the map above how close we are to the airport, only 2 minutes away. You will be transferred in next to no time. Only ½ mile from Leeds Bradford Airport we include on-demand free 2 minute transfers to and from the airport. How to find Sentinel Car Park, with directions and contact details.